Honda has confirmed its future line up will include more hybrid vehicles and, for the first time, plug-in hybrid and electric vehicle (EV) models from here forward. The company has shown a number of electric and hybrid propelled vehicles at the Tokyo Motor Show 2017. In addition, the Japanese company says they have been working on making their petrol-powered vehicles cleaner and more fuel efficient. 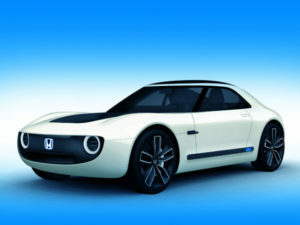 Most notably, the Honda Sports EV Concept is being exhibited for the first time, which the company says combines “EV performance and AI (artificial intelligence)”. The model builds on the success of the Urban EV concept, also on show, which is slightly shorter end-to-end than a Jazz supermini and indicative of an electric model due for launch in Europe in 2019 followed by Japan in 2020. Alongside the Sports EV and Urban EV concepts, Honda displayed the NeuV – another EV concept that explores automated driving technologies and AI. The car is said to make judgements about the driver’s state of stress based on facial expressions. Honda’s new CR-V with Sport Hybrid i-MMD system demonstrated Honda’s current hybrid twin-motor system, while the Clarity PHEV uses the same i-MMD drivetrain, but with an enlarged battery capacity providing it with an extended electric range of more than 62-miles (100km). The Clarity PHEV is due to go on sale in Japan in summer next year. Further indicating the company’s electric future, Honda added a PCX Electric and PCX Hybrid scooter to their line up, in addition to various e-mobility projects.